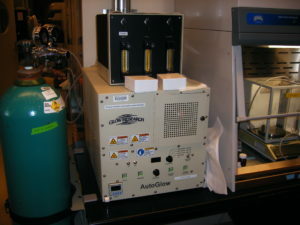 The Auto is a single chamber 4” barrel asher, with a 300W RF maximum power supply, generating an air or oxygen plasma. Plasma causes chemical and kinetic energy to either modify the top levels of a substrate surface, if Using lower energy air plasma, or to removal organic materials, such as photoresist, if using higher energy O2 plasma, on substrates no larger than 4”. Lower pressures equate to higher energies due to fewer inter gas collisions. Typical usages of low power are PDMS to glass bonding, often done for .2 min. (12 sec) at 100 W in air at 1 torr, and high power is typified by resist ashing done at 200 W and .5 torr, with time depending on resist thickness. RF Power of up to 250 or even 300 W can be used for short periods, but causes exhaust overheating after about 5 minutes. To see this procedure/SOP on the Glow Research AutoGlow at MIT click here. 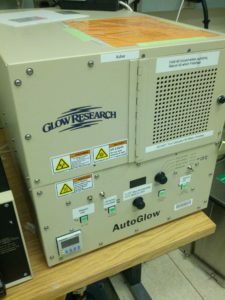 For more information or videos on the Glow Research AutoGlow click here. 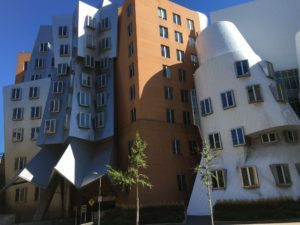 Unusual Building at MIT where one of the AutoGlow systems is located.